After rebooting Windows Server 2016 Essentials, all shares are in-accessible. When accessing the server locally using eg \\myserv I get a list of all shares, but when trying to enter one "The network path could not be found: 0x80070035". And they appear to be closed. What can I do. Tried restarting the server another 3 times already, still not working. C:\Users\Admin>netstat -a -o -n | find "445"
There the ports appear to be open? Firewall disabled, there is nothing in between the two machines!! Also the only change was rebooting the Windows server (guest) running on a Proxmox Linux host (KVM virtualization). All other ports (HTTP, RDP, ...) are still open. EDIT: Further inspection with TCPView and netstat -a revealed that the DNS process (dns.exe) allocates a couple of thousands of ports (growing) in the range 49000 - 65000. 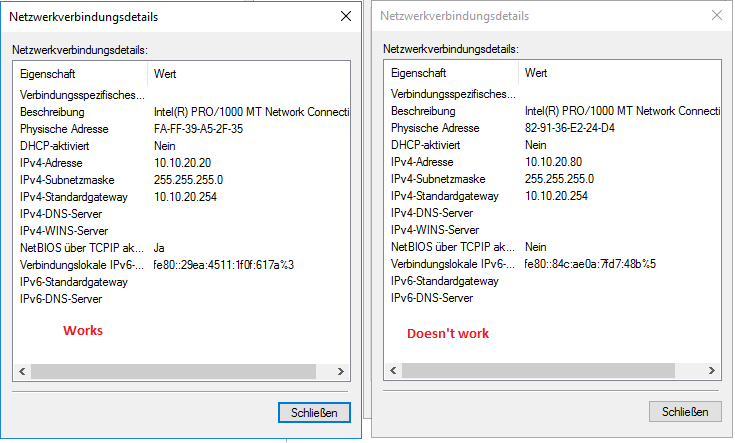 Here you can see the DNS is set to 127.0.0.1 (same for both adapters), also the default values were kept for NetBIOS on both interfaces! Can somebody help me figure out how this has happend and how to prevent it? The interface that works has NetBIOS over TCP/IP enabled. It actually makes sense that this would solve the issue if you truly don't have a DNS server configured on your network interfaces. The image you show does not show a DNS server configured. Being this is a domain controller, you should have 127.0.0.1 as the primary DNS server, and any other domain controllers as the secondary, tertiary, etc. All OTHER machines on the network that are not domain controllers should have one or more of your domain controllers configured as their DNS server - preferably via DHCP options. 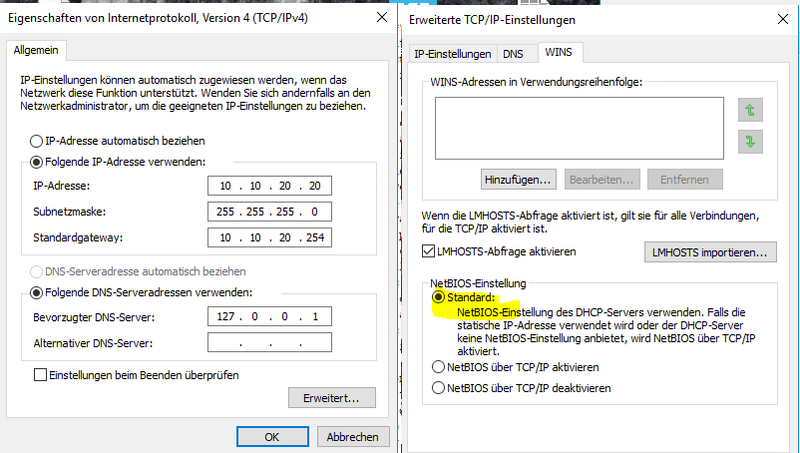 Without a valid DNS setting this domain controller is going to have all kinds of problems, and NetBIOS is an alternative name resolution service for file sharing. I just had this issue and as Appleoddity pointed out, it is the NetBOIS setting. I had it set to Default, changed it to Enabled and restarted. But the status details still showed it as not enabled. Using the reset commands didn't work either. I solved it by removing the network adapter and re-adding it. Not the answer you're looking for? Browse other questions tagged windows-server-2016 netbios or ask your own question. What is Windows Server 2016 administrator username?